Do you want to get each and every update activities of your subscribed youtube channels? 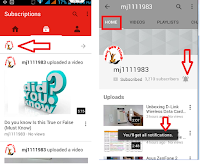 Yah you can get all the update activities from your subscribed channels in your phones, like android, windows, iphone or any other smartphone. You don’t need to install any extra app… You can do in youtube only. Lets see.